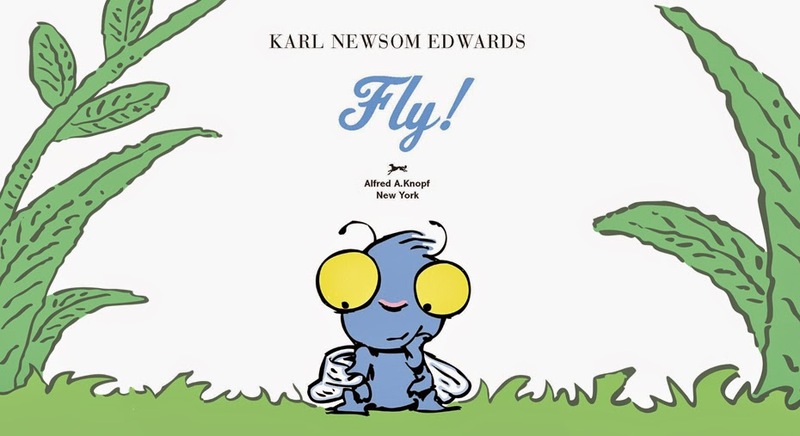 I'm reading Karl Newsom Edwards' Fly! to two kindergarten classes today. 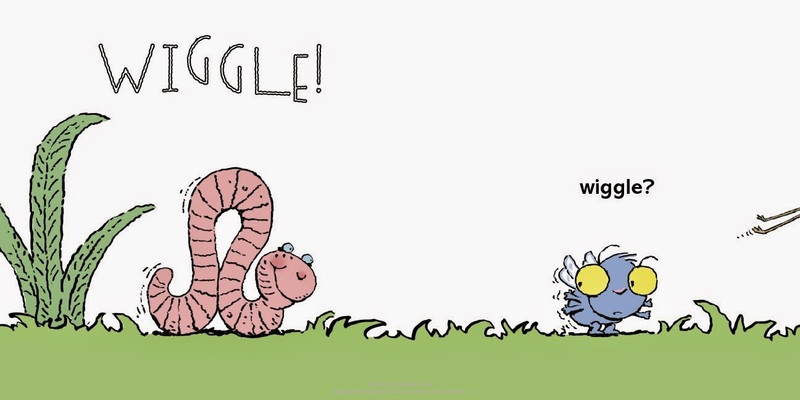 I cannot wait to watch them wiggle, jump, and roll! It is sure to be a hoot! 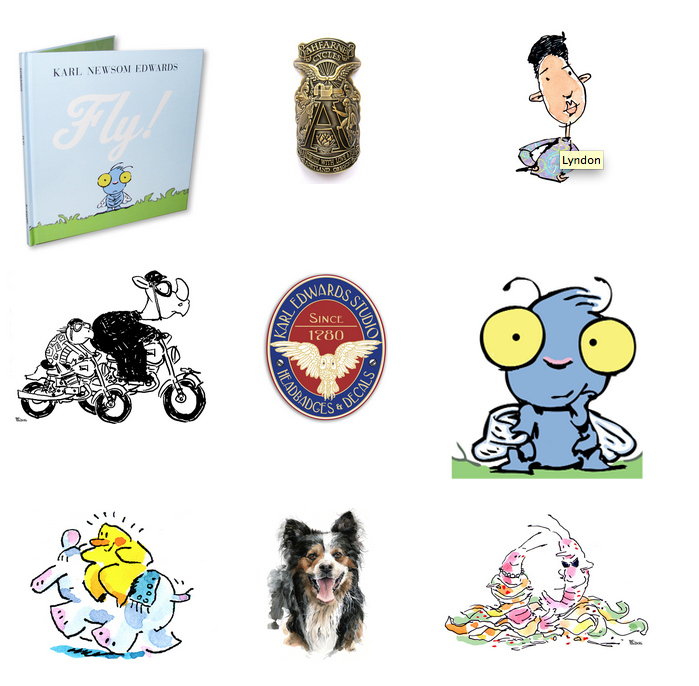 Karl dropped by to chat with me about Fly!, reading, picture books, and his bicycle. I wrote the words in orange, and he wrote the words in black. Thank you, Karl! You know Fly! is both a noun and a verb. I played around with the two meanings and came up with a story of self-discovery through perseverance. 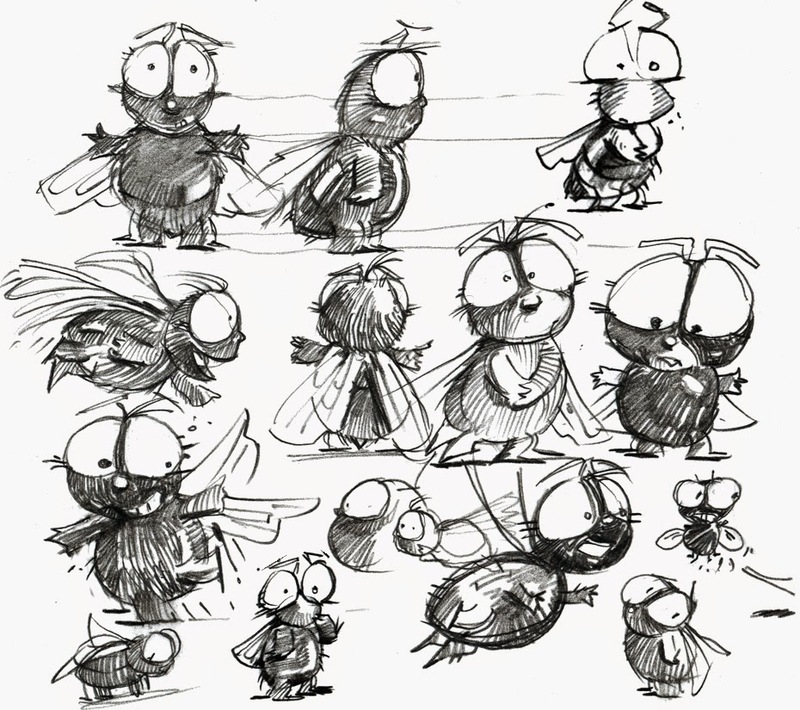 A small fly learns through trial and error that he is meant to fly. Once he figures it out, his identity and his way of moving around become totally integrated. I created the illustrations for Fly! 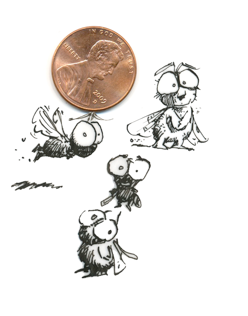 as teeny, tiny pen and ink drawings. I mean small, like a quarter of an inch. I then scanned and converted them in Illustrator to see how the irregular line quality looked when I enlarged them. It produced a really cool effect, but then I found I could get the same line quality on my WACOM tablet. An advantage of working digitally is that mistakes are easier to erase! I plan to go back to working traditionally in ink and watercolor on real paper, but for now, I'm enjoying this digital medium. 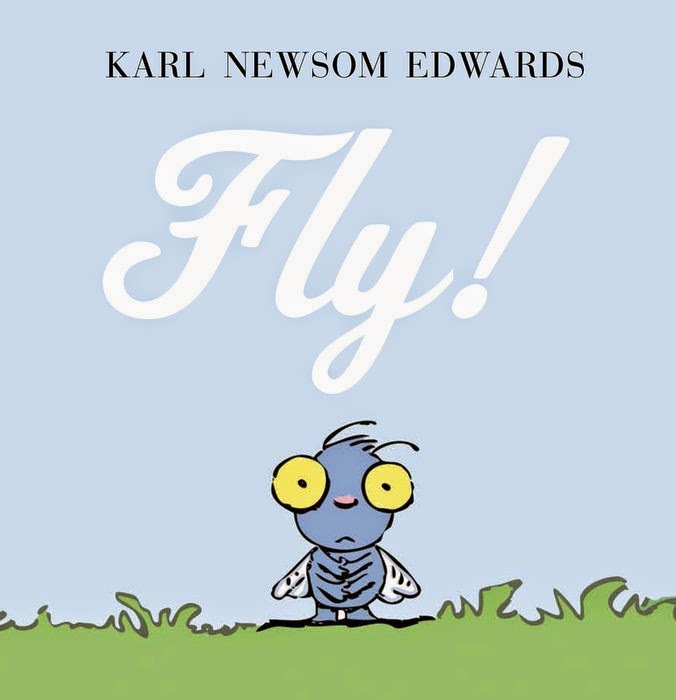 You should read Fly! to an adult who is frustrated or impatient. Better yet, have the adult read it out loud. Heck, it's only 13 words! 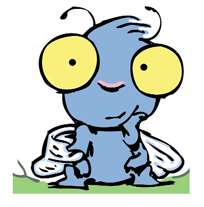 It may seem silly, but even grownups might learn something from the example of the little fly who perseveres despite failure and frustration. We all feel like dummies sometimes, but it's really important for both kids and grownups to overcome fear and try new things. If it isn't a good fit, try something else. Risk. Click here to view more initial sketches. I remember getting a D in algebra in 8th grade because I was painting a giant Spartan mascot on the gym wall and I avoided doing my math homework. Looking back, it was a good career move. Like, when do I use algebra? Reading is something that doesn't come naturally to me. I used to read books from the back towards the front. If there were plenty of pictures, I was okay, but lines and lines of gray text killed me. I do admire those who love to read. My wife is an avid reader, and I feel very calm watching her sitting in bed reading while I'm busy trying to do too many things at once. Picture books are often incredibly deep. The simplest stories can have such profound impact and can have so many layers. As a kid, I loved The Story of Ferdinand by Munro Leaf and illustrated by Robert Lawson. Lawson's ink drawings are so strong. That message about being yourself resonated with me. It's a theme I revisited in Fly! Mr. Schu, you should have asked me about the Insecticycle! I love bikes. I even restored and rode antique bikes built in the 1880s. The ones with the huge front wheel. The Insecticycle is a bike I hand-painted with a bunch of insects crawling, creeping, and flying all over the bike frame. 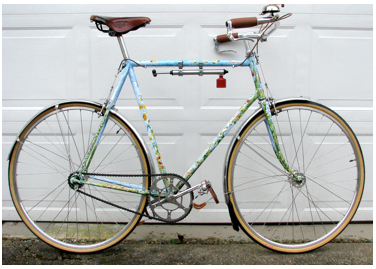 It is both a bike and also a wordless picture book. The images are not necessarily sequential, so kids can make up their own stories. I'm working on a new bike with a French frog theme, La Grenouille, but that is a story for another interview . . . Borrow Fly! from your school or public library. Whenever possible, please support independent bookshops. Love the art! Looking forward to reading this one!! And that insecticycle rocks!